Chemical peels or acid peels are known go-to treatments for anti ageing however they have a huge range of benefits for all ages. Skin Peels with AHAs (Acids) are excellent for the majority of skin conditions and types. 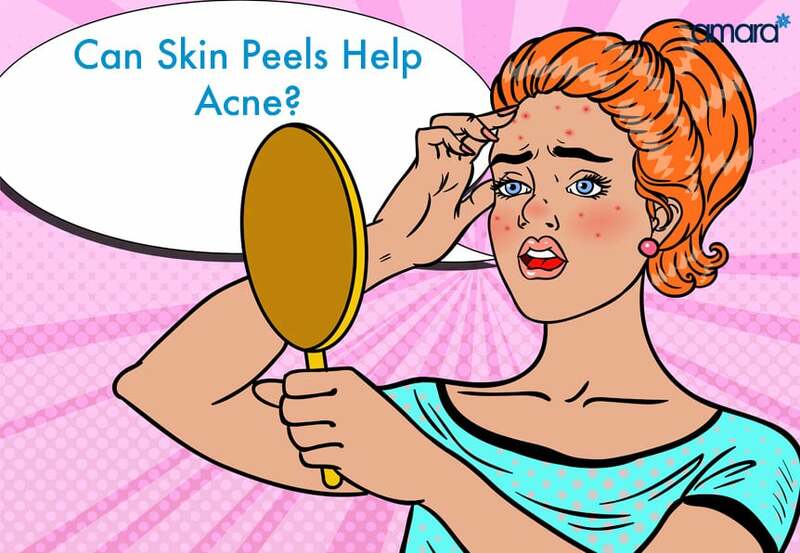 Can Acne Be Treated With Skin Peels? Skin peels can be used with different strengths and ingredients, depending on the peel itself will depend on who they are suitable for. For example, peels that may have high strength vitamin C may not be suitable for those with Acne. At Amara, we offer the ZO Stimulator Peel. The ZO Stimulator Peel contains 3 AHAs (Acids), Lactic, Glycolic & Citric. Though more known for reducing fine lines lactic acid has great benefits to Acne and Rosacea. Lactic Acid breaks down old dead skin cells and allows them to fall off the skin, revealing brighter, newer skin. Lactic acid is a gentle skin brightener that can be used all over the body to reduce pigmentation or marks. This creates an even skin tone fading pigmentation and even lessening acne scars. As Lactic Acid only penetrates the topmost layers it is suitable for most sensitive skins. As well as lightening marks lactic acid also helps to control oiliness and breakouts. Glycolic Acid is a known ingredient used to tackle acne. Glycolic is known for skin ‘peeling’ to remove damaged or dead layers of skin and to increase the hydration of the skin. Eliminating the dead skin with exfoliation help prevent and clear clogged pores, the main cause of acne. Exfoliation can also reduce inflammation in acne and help balance skin. Citric acid most commonly from lemons or other fruits. DO NOT PUT LEMON JUICE ON YOUR FACE. This is far too harsh for skin, particularly inflamed or irritated skin like Acne or Rosacea. The citric acid in a peel enhances other acids such as glycolic to help them work more effectively. As well as enhancing other ingredients citric acid is also a skin brightener which is why this peel leaves you with such a glow rather than a red face. The brightening effect along with extra exfoliation is excellent in treating pigmentation and lightning marks on the skin after multiple treatments. How Many Peels Would I Need For Acne? Though you will notice an immediate difference after just one Stimulator Peel. A course of 4 is recommended as an actual treatment. Ideally, a treatment a week for 4 weeks would be enough to treat your skin with deep exfoliation and cleaning. For an extra boost and added peptides, many people combine the peel with the HydraFacial MD resurfacing treatment. The ZO Stimulator peel replaces the HydraFacials own and with the added steps of impurity extraction, hyaluronic and peptides then followed with Blue and Red LED lights to kill bacteria and reduce inflammation. How do I Get a Skin Peel? As a skin peel can be done on the same day you book in, your skin health specialist will advise you of the treatment and everything to expect, they can also advise you on other treatments or products that will enhance your treatment results. To find out more about a skin peel for acne or to book in you can use this link.